The Turtles’ own Howard Kaylan penned the feature film “My Dinner With Jimi,” a reenactment of what happened when his band mates met their rock heroes. LOS ANGELES, Calif. — A slew of films about the British rock scene of the 1960s will make it to the marketplace this year. Beating them to the punch, at least on DVD, is My Dinner With Jimi. The film was written by someone who was actually there: The Turtles’ lead singer Howard Kaylan. In 1967 the Turtles, riding high with their mega-hit “Happy Together,” were flown to England for promotion, and wound up hanging out with many of their heroes. The film follows the band as they encounter rock stars of the day, including the Beatles, Jim Morrison and ultimately, Jimi Hendrix. Rhino Entertainment’s co-founder Harold Bronson, the movie’s producer, pushed the production to achieve a historical accuracy lacking in similar films. 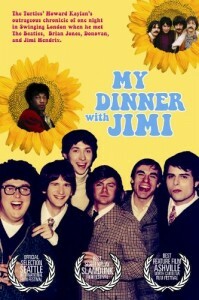 My Dinner With Jimi is the fourth feature directed by Bill Fishman (Tapeheads, Ramones videos). Produced for Rhino Films, the movie, with bonus material, will be released by Micro Werks on June 9, distributed through Infinity Entertainment Group. Royale Watkins stars as Jimi Hendrix, whose performance Variety called “a completely believable turn.” Academy Award Nominee Justin Henry plays Howard Kaylan, and Jason Boggs plays Turtle Mark Volman. The Turtles’ other hits include “Elenore,” “You Showed Me” and “She’d Rather Be With Me,” and they hold the distinction of having been the first rock band to play the White House. They still tour a minimum of 50 dates per year as the Turtles featuring Flo & Eddie.